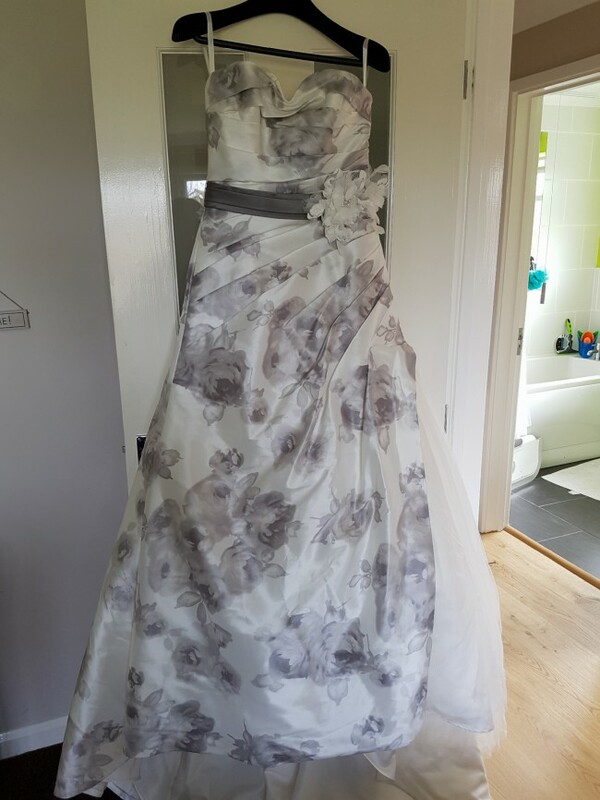 Benjamin Roberts wedding dress in a size 12. White satin with a silver rose print. Has a full tulle under skirt, loops under the skirt to pull up the train later in the day and a zip fastening. The dress originally had a straight neckline but I had this altered to a sweetheart neckline. Features a silver belt with fasteners to wear at different sizes. Belt has a flower which has feathers and diamantes. Dress has been fully dry cleaned. The dress originally had a straight neckline but I had this altered to a sweetheart neckline. Once you send a message, Toni can invite you to purchase the dress.